Orders rise at LED makers Everlight and Epistar last December. After nearly three quarters of sagging market, Taiwan's top-two makers of light emitting diodes (LEDs) saw orders rise in December, 2015, and believe the high season will likely arrive after the upcoming Chinese New Year break, which falls on Feb. 6-14. In spite of the downtime for inventory taking, Epistar, recognized as Taiwan's No.1 LED chipmaker, still saw its revenue for last December rise 19.12 percent from a month earlier to hit a fresh high of NT$2.15 billion (US$65.42 million) since last May. Company executives attribute the stellar growth mostly to the rush orders from TV makers, who use Epistar's chips as backlights, and have begun to build up LED backlight inventory to cope with the Chinese New Year shopping season. They point out that many of the company's customers have been anxious about their inventory backlog since the beginning of the second half of 2015, when chip prices had begun slumping. Although Epistar executives feel that the prospect of the company's business will remain uncertain in 2016, they think business should pick up beginning this March because brand-name TV makers typically begin to place orders for the chips in March or April to replenish inventory for rollouts of new products. In 2015, global shipments of LED TVs were cut to 217 million systems, and luminous efficacy of LEDs was further boosted, with both factors having dampened shipments of LEDs. To shore up average selling price (ASP), Epistar has begun designing its chip-scale package (CSP) LEDs into customers' backlights since late 2015 and will massively ship the chips this year to TV makers that adopt direct back-lit modules. 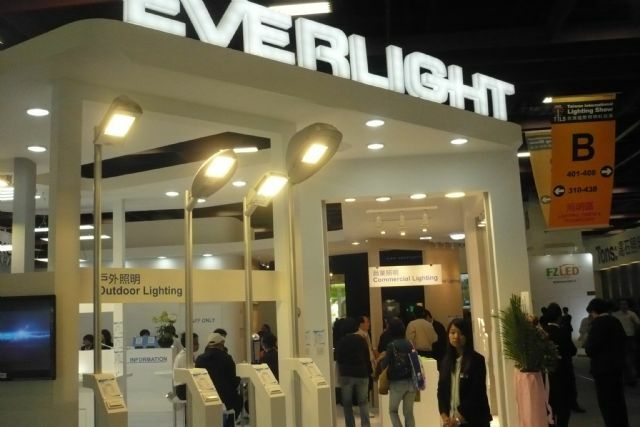 Everlight Electronics Co., Ltd., Taiwan's biggest LED packager, generated revenue of NT$2.57 billion (US$78.15 million) last December alone, rising 1.58 percent month on month to hit a new high since the same month of 2014. The December result helped swell the company's revenue for the final quarter by 5.2 percent sequentially to the annual peak of NT$7.43 billion (US$225.42 million). However, the company's annual revenue contracted 5.86 percent year on year, to NT$28.81 billion (US$873.30 million). Company executives ascribe the impressive quarterly result mostly to increased orders from lighting and TV makers. They point out that order visibility for the company looks optimistic in 2016, albeit with January and February still remaining a lukewarm season. The packager made NT$414 million (US$12.54 million), or NT$0.96 per share, in after-tax net income in the third quarter alone partly thanks to revenue from foreign exchange trades. Throughout the first three quarters, the company netted NT$1.29 billion (US$39.09 million), or NT$3.01 per share, prompting industry executives to put the company's 2015 annual net revenue at NT$4.0 per share. In spite of lingering downward pressure on prices into 2016 due to oversupply, industry executives feel Everlight's gross margin for this year will likely rise from last year's 23.5 percent thanks to improved cost structure at the company. They estimate sales from LEDs for lighting applications to account for a quarter of the company's revenue by the end of this year in anticipation of increased orders from European and American lighting makers after securing orders from four of the world's leading brand-name lighting makers.